Create Product Bundle – Createing Product Bundle is very similar to creating normal product, Look for “Product Bundle” from the General tab and enter all product that you’re going to include in the bundle ( One per Line ). ( Tips: Search by Product Categories or Tags will list all related products. ) You will notice that the Product ID is displaying at the beginning of your product name and started with “#” we’re going to use these Product ID in next step. Note: When you add new product to this bundle remember to check “Update existing order” that will automatically update existing order for all customers. 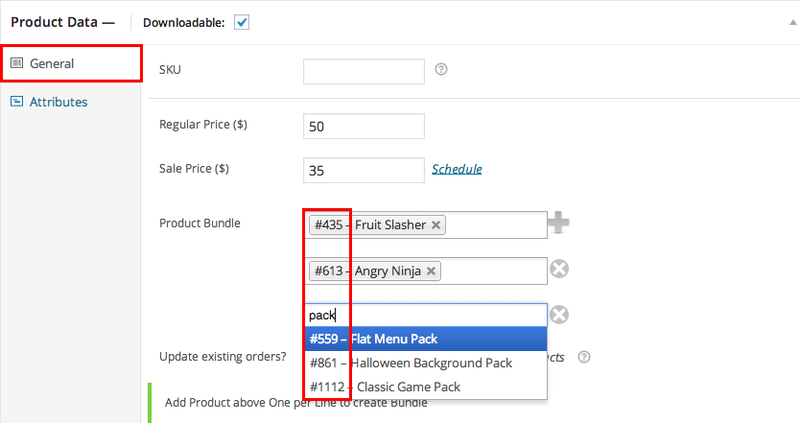 Create Product Slider – Once you’ve created a product bundle you’re going to create a product slider on your product page so that customers can see what’s in this bundle. Simply put this code [woo_product_slider prod_ids=” You Product IDs “] under the Product Bundle Description ( Paste In Text version ) and replace “You Product IDs” with your actual product IDs and separate them with comma. Complete the other informations for the bundle such as Bundle Description and Featured Images and you are ready to submit it for review.